I have had a few people ask me recently about my penchant for hiding veggies in the food I make. ‘Why don’t you just give them veggies?’ or ‘they won’t grow up eating veggies if they never see them’. Well, I need to preface this by reminding you that I am not a health care professional, so I can only give you my experience and what works well for us. Firstly, we do give them ‘just’ veggies – every day and in different forms; raw, steamed, roasted, mashed etc etc. However, 3 of the 4 kids are fussy eaters (argh! ), most particularly our little miss! Despite us not giving in to her demands for sausages and chips every night and refusing to make alternatives to the family dinner, she will regularly choose to not eat any dinner. For days at a time. Frustrating beyond belief, especially since we are concerned for several deficiencies that she has due to her allergies. So as well as giving them the obvious veggies (and talking to them about our food, growing our own and involving them in the preparation of them!! ), we hide it too, so that when she does eat, she is getting extra bits that she doesn’t know about. Peace of mind for me to know that we are going some way to helping their little bodies grow and thrive. I think I really should just call this Chocolate cake because no one could tell there were legumes in it! I take this one to church for supper and we avoid all nuts there because of allergy concerns with communal eating, so for a nut free version I replaced the 50g of almond meal with 50g of roasted sunflower seed meal. Place sugar in processor and grind until it resembles castor sugar (Speed 7, 8 seconds). Add in rice malt syrup, coconut oil, vanilla, quinoa and drained chick peas (but keep the liquid aside!). Process until well combined (Speed 6, 15 seconds). Then add in 5 tablespoons of the liquid reserved from the chick pea tin (called Aquafaba – this is a fabulous vegan egg replacer). If you don’t need to avoid eggs, you could use 2 whole eggs at this point instead. Add cacao and baking powder and pulse a few times to combine. 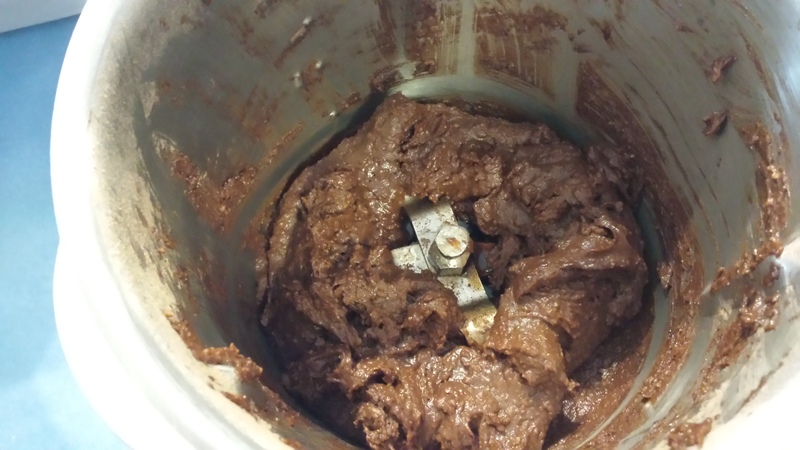 It will be quite a thick chocolatey mix at this point. Add in the warm water and process to combine (Speed 4, 8 seconds). Add in the flour and meal and process to combine (Speed 4, 15 seconds). 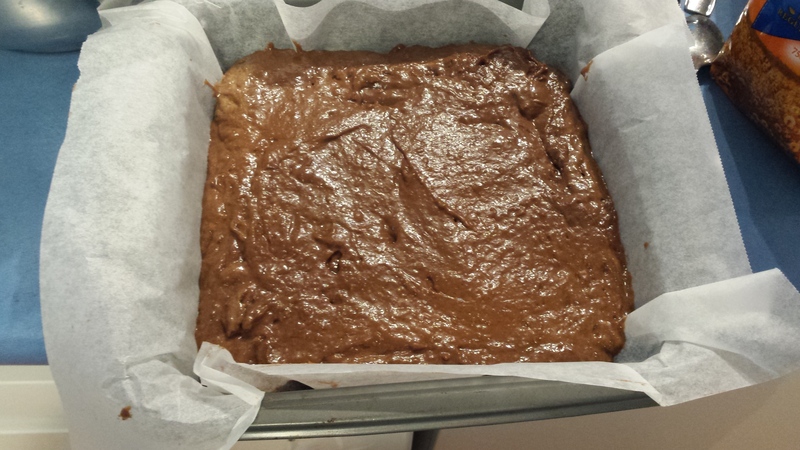 Pour into a lined baking tin (mine was a 20cm square tin) and bake in a preheated 180C oven for about 40 minutes, or until an inserted skewer comes out clean. Allow to cool before slicing, and ice if you wish. Sometimes we sprinkle with pure icing sugar. Today we made icing with 1 tbsp (room temp)Nutelex, 1 tbsp Chocolate drinking mix and pure icing sugar, beaten until soft and spreadable. Yum!! P.S. If you like the chocolate and chic pea combination – you should check out my Date, Chic Pea and Sunflower Seed Butter Cookies!